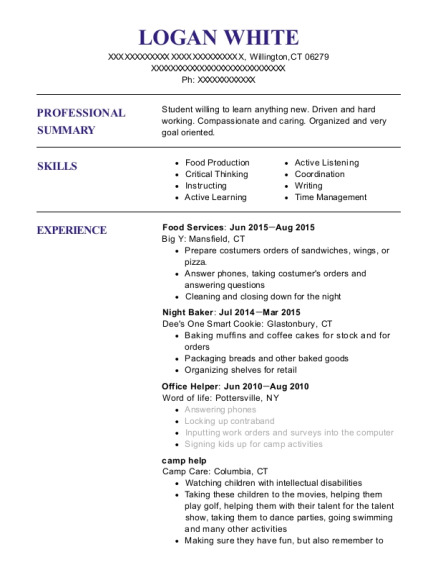 Friendly and enthusiastic Cook/Baker with several years of specialization in large quantity food preparation. Able to learn new tasks quickly and proficient in growing key customer relationships. Represent establishment with friendly, professional demeanor at all times. Skilled Baker - Able to produce a variety of baked goods from scratch. Can produce large quantities or individual portions. Innovative and creative - Able to create food dishes from whatever ingredients are available. Creative use of spices and herbs for exceptional flavors. Ability to work under pressure - Worked in bakery and cafeteria environment requiring strict timelines and deadlines be met. Pleasant Personality - Friendly, sociable, understanding person able to help people achieve their goals and resolve problems. Skilled Manager - Experienced in management of personnel and processes. Proven Trainer - Trained personnel in food preparation techniques, safety and sanitation. Roll, knead, cut, or shape dough to form sweet rolls, tarts, cookies, or other products. Operate slicing and shaping machines. Observe color of products being baked and adjust oven temperatures, humidity, and temperature accordingly. Drivers Helper Dec 2013－Jan 2014 UPS － Belleville, IL Responsible for helping the UPS delivery driver deliver packages, load truck, arrange packages for delivery order, scan and track packages, record incoming and outgoing packages. This was a seasonal job. Apportion and serve food to students and teachers. 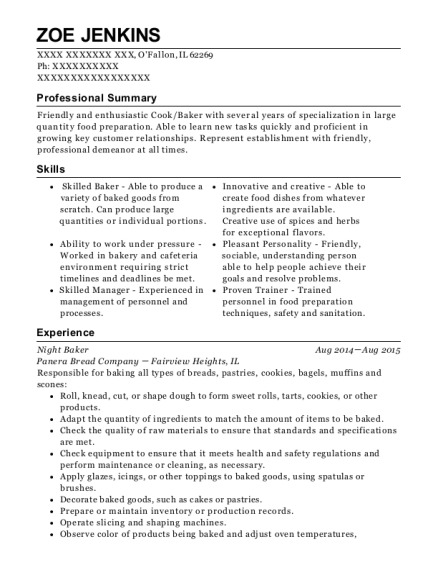 This is a resume for a Night Baker in O'Fallon, Illinois with experience working for such companies as Panera Bread Company and UPS. 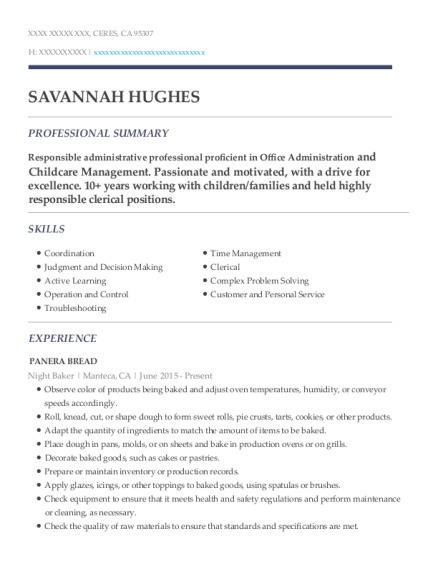 The grade for this resume is 0 and is one of hundreds of Night Baker resumes available on our site for free. 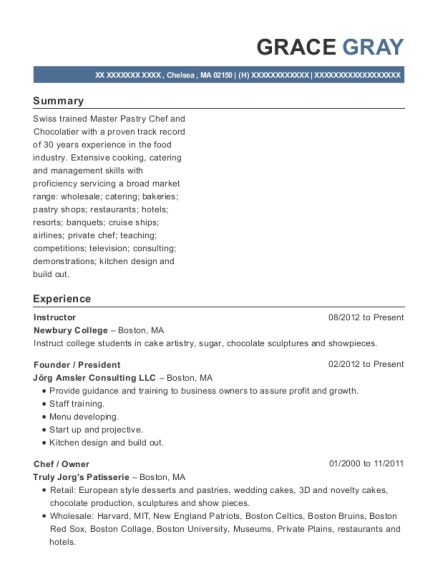 Use these resumes as templates to get help creating the best Night Baker resume.